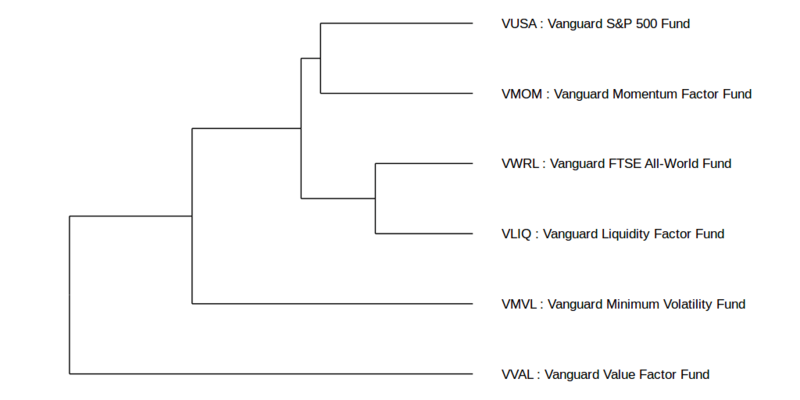 What are Vanguard Factor Funds? These active share funds aim to produce long-term returns greater than the equity market as a whole by selecting stocks that possess attributes, called factors, which have historically outperformed the broader market. These include stocks which trade below their fundamental model-based price (value factor), have strong recent past performance (momentum factor), have low trading volume (liquidity factor) or combine to produce low volatility (minimum volatility). If you want to cook a special meal from scratch for your friends or family it isn't easy. First you have to plan a meal that you think they will like, not easy if you have to cater to fussy eaters or allergies. Then you have to buy the raw ingredients from your supermarket. Once you have the ingredients they have to be measured, washed, chopped and cooked. Wouldn't it be simpler if you had proven recipes that produce reliably tasty meals and the fresh ingredients were delivered to your door? 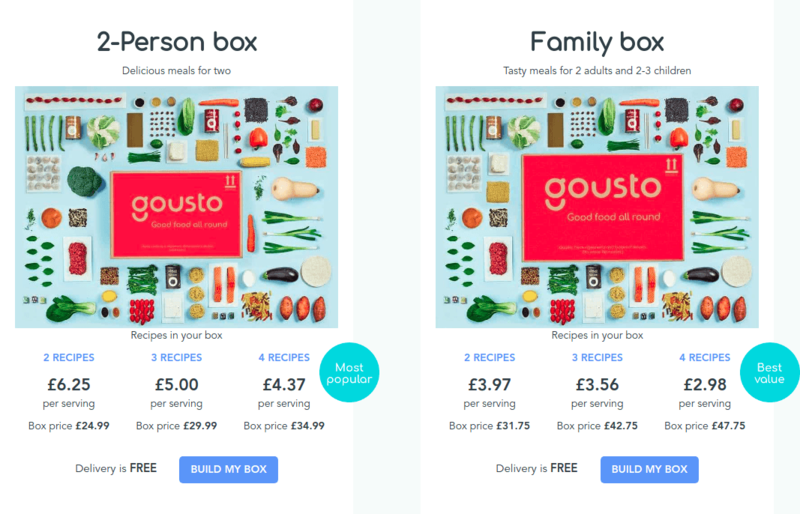 This is the business model for companies such as Gousto, Riverford and Hello Fresh. For one evening you can become a celebrity chef, all you have to do is combine the ingredients and take the credit for a delicious meal. Vanguard's factor funds provide four research-proven recipes. Instead of choosing individual stocks that are aligned with a particular style you can buy one or more of these funds. But just as a good cook knows their ingredients a good investor is curious about what's in the investment recipe. Below we look inside the four funds in more detail to see what they contain and what they are trying to achieve. 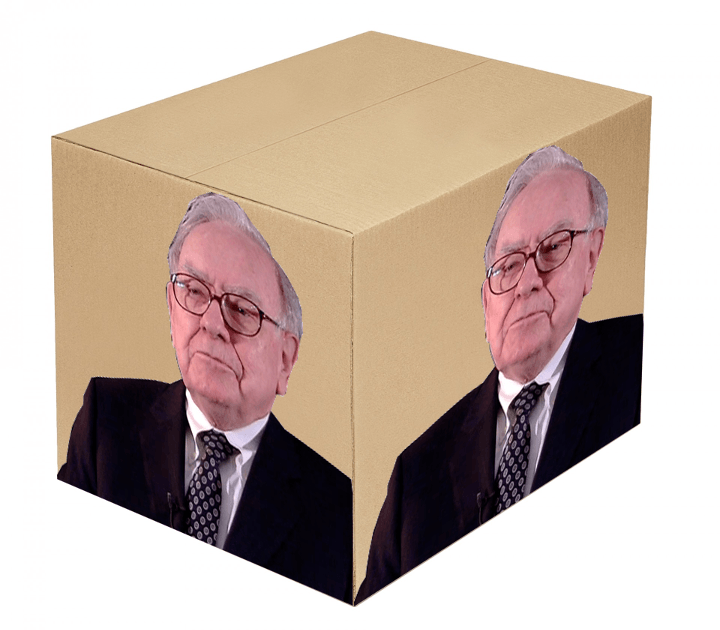 If you read anything about investment you will have heard various quotes from the legendary Warren Buffett. Unlike the vast majority of fund managers he has outperformed the broader market over many decades. His approach is to choose stocks that look undervalued, an approach called value investing. "The Investment Manager’s quantitative model implements a rules-based active approach that aims to assess the factor exposures of securities, favouring equity securities which, when compared to other securities in the investment universe, have lower prices relative to their fundamental measures of value (which measures may include price-to-book or price-to-earnings ratio, estimated future earnings and operating cash flow). This measure has been shown to be a component of long-run stock market returns." The fund uses several models of share value to filter the stocks that are included in the fund. Let's look at each briefly. Remember that for all four measures a value investor favours shares that have a low valuation i.e. a low Price to Book, Price to Earnings, Price to Estimated Future Earnings or Price to Operating Cash Flow ratio. This doesn't take future earnings into account, it provides a crude measure of what's due to the shareholders at any point in time. Another measure that's sometimes more useful is Tangible Book Value which only includes assets such as cash, real estate, plant machinery... and excludes weird accounting numbers like "Goodwill". Companies exist to generate profit, also called earnings. When you buy a company you often get a share of those earnings paid to you in cash as a dividend. As the company grows its earnings the share price usually grows in line with those earnings so you benefit from capital growth of your investment. Earnings are key to investment! This valuation measure, usually abbreviated as PE, works out the price of each share divided by the earnings the company generates. If the share price is £10 and the company is earning £1 per share then PE ratio would be 10 / 1 = 10. If the price was £20 for a company that earns £1 per share that company would be much more expensive at a price to earnings of 20 (20 divided by 1). Price to earnings can also be based on a guess about future earnings. It's an educated guess, often involving mathematical models, but a guess nonetheless. Nobody knows what earnings a company will generate. However there are cases where this is interesting, such as rapidly growing tech companies. The PE ratio for tech companies often looks ridiculously high because people are paying extra for growth. Price to future earnings is a ratio that corrects for this growth by factoring in growth expectations. But remember it's only as good as the guess! Cash flow is the lifeblood of a company. For example if you pay money for raw materials then earn money from selling your finished goods to clients the operating cash flow is the difference between the two. If some of your company earnings came from financial investments those are excluded and any interest you pay on loans is also subtracted. Price to operating cash flow tells you how much you are paying in pounds for each pound of operating cash flow generated by the company. Investors like companies that have a low price to operating cash flow ratio because you are paying less for a highly cash generating business. When small children play football there's no spacing of players or passing. Instead there's a little mob chasing the ball around the pitch. Market rallies are similar. When investors spot a trend they tend to pile in and extend the rally far beyond the point where valuations are reasonable. The same happens on the way down as panic feeds on itself and drives valuation far below rational levels. It can make sense to follow these trends but timing your entry and exit is notoriously difficult. Vanguard looks back over two time periods: 6 months and 12 months. They look at both return and risk adjusted return (which is penalised for volatility) over these two periods and use this to select stocks that are rising more (or falling less) than average and buy more of these outperforming stocks. "The Investment Manager’s quantitative model implements a rules-based active approach that aims to assess the factor exposures of securities, favouring equity securities which, when compared to other securities in the investment universe, have relatively strong recent past performance. Past performance will be assessed in terms of both non risk-adjusted and risk adjusted return, over the shorter (approximately 6-months) and intermediate (approximately 12-months) periods prior to the acquisition of the securities by the Fund. This measure has been shown to be a component of long-run stock market returns." A big company that has a large presence in the stock market will have a large "market capitalisation". This is the number of shares times the price for each share. For example here are two stocks. Flybe is a very small company and Royal Dutch Shell is a very large company. Shell has over 8 billion shares and when this picture was created was worth 20 pounds and 80 pence per share. Multiply the two together and you get the market cap of £170 billion. Stocks on the London Stock exchange have market capitalisations ranging from £100 million (£100,000,000) up to £200 billion (£200,000,000,000). The larger the company's market cap the more shares change hands every day. This is called turnover and is one measure of liquidity. Think of liquidity as the time it takes to sell your asset and turn it into cash. Another liquidity measure is how much the price moves when large trades occur. The most liquid stocks can absorb larger trades without shifting the price whereas low liquidity stocks will suffer a larger price impact. Researchers have noted that companies whose shares had low liquidity tended to outperform shares with high liquidity over the long term. Vanguard's Liquidity Factor Fund favours stocks that have low liquidity measured using all these methods. "The Investment Manager’s quantitative model implements a rules-based active approach that aims to assess the factor exposures of securities, favouring equity securities which, when compared to other securities in the investment universe, have low trading volumes and other measures of trading liquidity, including lower trading share and dollar volumes, based on percentage turnover, and price impact. These measures have been shown to be a component of long-run stock market returns." Choose Safe Stocks: Select stocks that have small daily price fluctuations. These are usually safe stocks like utilities that don't generate much capital growth but pay a steady dividend almost as if they were bonds. Diversify: Select stocks that increase diversification because their daily price movements have low correlation with one another. Vanguard adopts an indirect approach in its Minimum Volatility Fund. It considers the effect of several of a stock's attributes on volatility (listed below) and also chooses stocks that have low correlation. "The Investment Manager’s quantitative model evaluates the securities in the Benchmark by reference to characteristics designed to measure their exposure to a variety of factors that drive a security’s volatility such as industry sector, liquidity, size, value and growth. The model also assesses the interaction between these factors and their impact on the overall volatility of the portfolio. The Fund’s investments will be selected based on the output of this model." We obviously want to know how much risk we're taking with these funds but also the historical return. If we had invested £10,000 at the inception of these funds at the end of 2015 these are the values of the four investments over time. 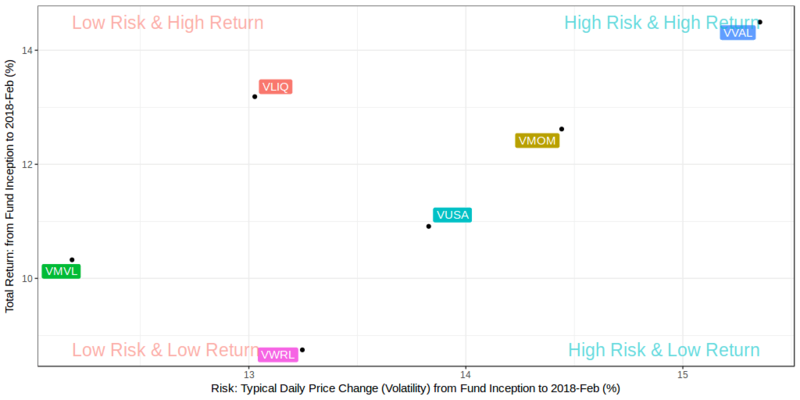 A risk-return plot shows the return over the life of the funds (until February 2018) and the Value fund (VVAL) clearly has the highest risk (15.4%) and return (14.5%) of the four funds. Minimum Volatility (VMVL) has the lowest risk (12.2%) but also the lowest return (10.3%). The Liquidity (VLIQ) and Momentum (VMOM) funds lie sandwiched between these two extremes. 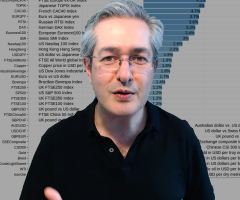 For context I've shown the risk and return of the FTSE All-World fund (VWRL) and the US S&P 500 fund (VUSA). 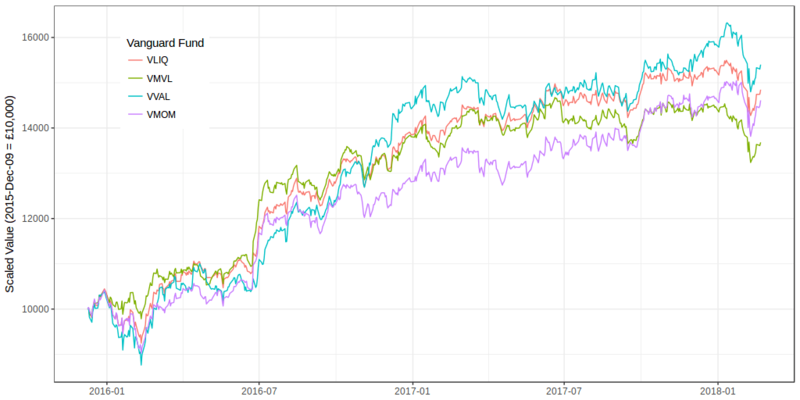 VVAL, VLIQ and VMOM have all outperformed these standard stock indices, however it's hard to draw any conclusions given the very short lifetime of these funds which is just over two years. -1: Two assets move in opposite directions all the time and offer the greatest diversification. The first thing to note is that the funds are highly correlated with one another and with global equity markets. Possibly the only exception is the correlation between Minimum Volatility and Value which is still a high-ish 0.77. If you want diversification you should look elsewhere, possibly to other asset classes like government bonds or corporate bonds. An easier way to see the relationships is as a tree. Funds which are on nearby branches have higher correlation. The fund which is out on a limb is the Value Fund, whereas over this period the Momentum Fund was highly correlated with the S&P 500 and the Liquidity Fund was highly correlated with the FTSE All-World Fund. 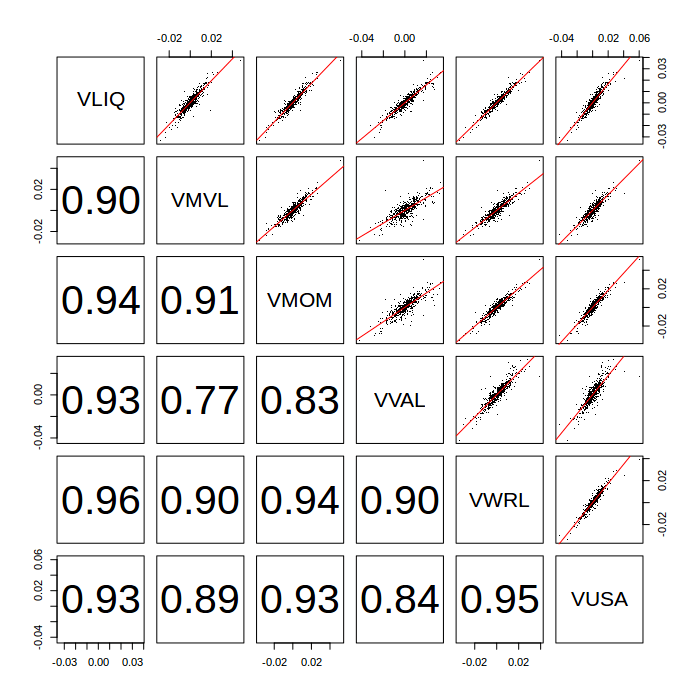 What will be interesting is to see how these correlations change as we get more data and witness more market selloffs. It may be that the last two years (2016-2018) were somewhat special given the low volatility environment and strong global equity rally. Some factor funds deliberately cancel out their sensitivity to the market as a whole, they are market-neutral. They do this by buying stocks that have high factor exposure and short stocks that have negative factor exposure. For example a long/short value factor fund would balance its "long" exposure to cheap stocks with "short" exposure to expensive stocks. If the market as a whole e.g. VWRL rises or falls the long/short value fund would not be affected. Its price depends only on the rise in price of its cheap stocks versus its expensive stocks. Vanguard have not done this. Their funds are long-only, they never short stocks by selling stocks they do not own. These are the market "betas" or how much overall market you are buying as part of the fund, for the four factor funds. You can see instantly that they are not long/short funds whose betas would be close to zero. A beta of 1 means that you are tracking the global market (I used VWRL as a proxy for the global equity market). All four funds aren't far from a beta of one. 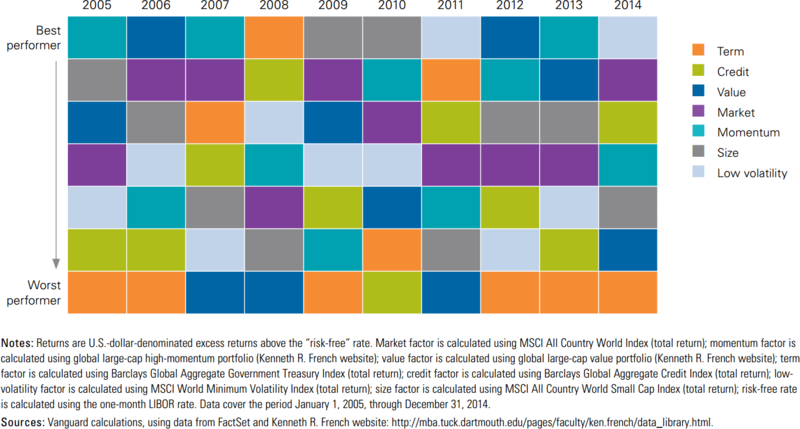 Only Minimum Volatility deviates somewhat from owning the global equity market. Consequently don't be surprised if your funds seem to move up and down with global markets: that's what you'd expect from these beta values. As with any fund you should always look at the fee that you pay the fund manager. 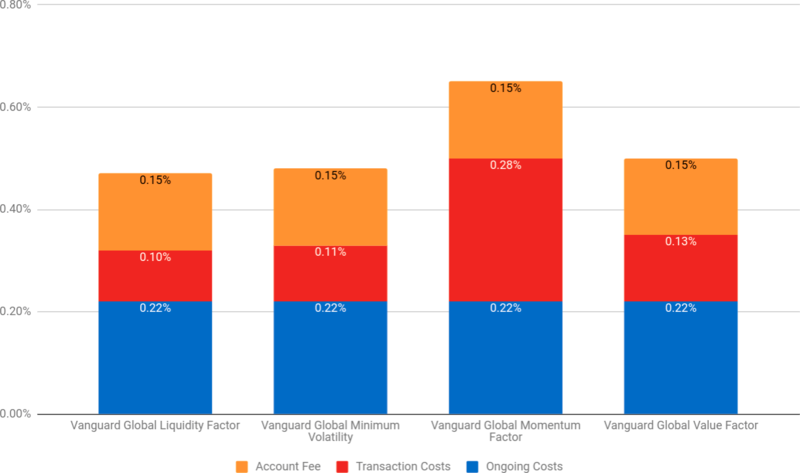 As this is Vanguard the fees are low at 0.22% per year for all four funds. On a £10,000 investment that's £22 per year that you would pay to Vanguard. That is roughly what you would pay for passively tracking a share index (for example VWRL is 0.25%) but more than you would pay for the largest and most liquid share indices (VUSA is 0.07%). But when you consider that these are sophisticated active funds 0.22% is an extremely low fee. Thanks to Mifid II legislation we now also have a breakdown of transaction costs and account fees. Account fees are the charge that you have to pay platforms (such as Vanguard UK Investor, Interactive Investor, Hargreaves Lansdown, TD Direct, AJ Bell and Fidelity) to hold the funds that you buy. In the graph above you can see that Vanguard charges 0.15% per year to hold your fund. If you buy these funds through other platforms this account fee will differ. The fee which is new and invisible, because it never appears in the bill from your broker, is transaction costs. These reduce your return because the fund manager is paying fees to their stock broker, usually an investment bank, every time they trade stocks on your behalf. The more they have to trade the higher the transaction costs. The fund that stands out is the Momentum Factor fund because Momentum reverses all the time and the fund has to buy and sell to track those reversals. Contrast this with Liquidity where membership of the factor is stable: if a stock had low liquidity last year it will have low liquidity this year. That means less trading and less drag on return. As with anything in the financial world there are no guarantees that any of these strategies will outperform a cheaper and simpler global stock index tracker like VWRL. Markets and the global economy go through phases when one of these factors will outperform the others. Here are the ranked best performing factors each year from 2005 to 2014 from a Vanguard report on factor investing. Sometimes Value outperforms (2006, 2012), sometimes Momentum (2005, 2007, 2013), sometimes Low Volatility (2011, 2014) and sometimes Size, which is the outperformance of small-cap stocks versus large-cap stocks (2009, 2010). It's interesting to think about what makes these factors "work". 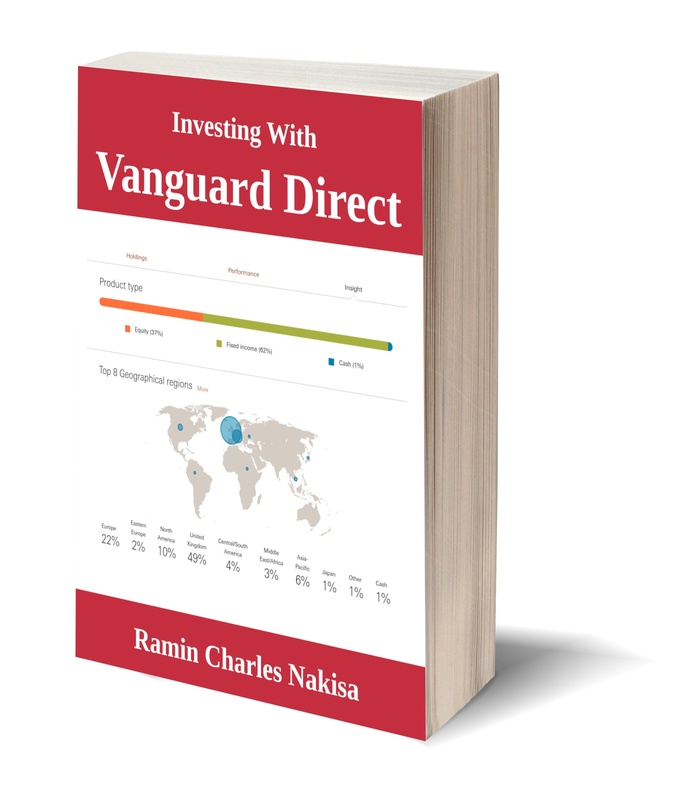 Vanguard presents two explanations for each factor. One is based on rational pricing which means that investors who take a risk are compensated for that risk. The other explanation is based on behavioural investing which is the powerful but irrational force of human cognitive biases in markets. This leaves open the intriguing possibility that we could use the state of the global economy to guide our choice of which factors will outperform. Momentum: performs best during periods when markets are trending steadily upwards. Value: performs best when fundamentals are driving markets at the mid to latter stages of a period of strong economic growth. Low Volatility: during severe equity selloffs (Dot Com bubble bursting, Global Financial Crisis) Low Volatility outperforms the market and also during steady rallies (like 2003-2006). This strategy favours bond-like equities which lose value if interest rates rise so this is a risk to consider as central banks raise rates. Liquidity: this is an evergreen factor in the sense that the big players in equity markets are forced to buy large-cap liquid stocks e.g. index tracker funds, very large funds that manage billions, pension funds... By taking the other side of this trade you can consistently harvest this illiquidity risk premium. As you can tell these funds are probably not for beginners. Also you may want to have more than one factor fund as the higher-risk equity part of your portfolio because it is extremely difficult, if not impossible, to guess which factor will outperform. What research shows is that all these factors have outperformed the market as a whole historically. But factor funds only work if you stick to your guns long-term. In other words don't buy a value fund, notice it underperforms after a couple of years and then sell it. Long-term means decades and going the distance means you have to exercise brutal discipline by not selling!